Paperboy Remix, 2013. 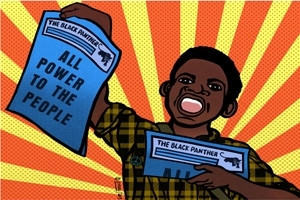 Emory Douglas. Next, D.C. members of the African Commune of Bad Relevant Artists, or AFRICOBRA, and other, more contemporary D.C. artists respond to Douglas’s work with sculpture, paintings, photography and multi-media installations. Their work examines the same social justice issues the Panthers fought for that are relevant today. Artists include: AFRICOBRA artists Jeff Donaldson, James Phillips, Akili Ron Anderson, Jae Jarrell, and Wadsworth Jarrell along with Holly Bass, Graham Boyle, Larry Cook, Wesley Clark, Jay Coleman, Tim Davis, Jamea Richmond Edwards, Shaunté Gates, Amber Robles Gordon, Jennifer Gray, Njena Surae Jarvis, Simmie Knox, Beverly Price, Sheldon Scott, Stan Squirewell, Hank Willis Thomas, and Frank Smith.